Grammy-winning Alanis Morissette is the new reigning queen of power pop. Her hit album Jagged Little Pill and the subsequent well-deserved acco­lades place her squarely in the ranks of artists to be reckoned with. Ironic is one strong reason why. This popular cut is a marvelous showcase for the tight arranging approach and tuneful but dynamic style of Morissette and produc­er/ collaborator/multi-instrumentalist Glen Ballard. In Ironic, we hear a skill­ful juxtaposition of light acoustic folk­like timbres and heavy electric hard rock sounds. Additionally, some beautiful supporting guitars—acoustic, and clean and distorted electrics – are overdubbed and layered into the arrangement, further color­ing an already gorgeous track. The acoustic guitars (Gtrs.l and 3) are capoed at the 4th fret. This means using a barring device which clamps onto the neck to change the “open key” of the instrument. For example, clamping at the 4th fret trans­forms the 4th position into a higher-pitched open position. The 4th fret becomes the new nut” [Fig. 1]. Playing an open C chord at what would be the new open position (new nut) will result now in the sound of an open E chord. Capoing enables you to play in dif­ferent keys using familiar open chord shapes, and also create a distinctive, jangly tone. And the higher up you capo, the brighter the tone becomes because you’re shortening the string lengths. When capoing, make sure to check your tuning after clamping it down— often, the capo’s pressure will cause some or all of the strings to go sharp or even flat. In the transcription, notice that the actual pitch chord is notated on top, and the open chords (what they would be named if they were played without a capo) appear in parenthe­ses under the actual-pitch chord name. In referring to the chord names in these perfor­mance notes, I’ll be calling them by their actual-pitch names, so that the acoustics and electrics (which are not capoed) in the arrangement can share the same key desig­nation. The articulation approach in Ironic is folkish, using fingerstyle technique to pluck and arpeggiate chords and play melodies. The intro figure uses one shape moved up the neck to create two distinct chords. This is an E major seventh shape moved up two frets to become the more exotic “cluster” voicing: F#6add4 [Fig. 2]. One of the advan­tages inherent in guitar playing is the ability to move a basic shape around the fretboard in this way. Through its changing relation­ship to the open strings, a number of inter­esting sonorities and resonant effects can be generated. In Ironic, this is enhanced by the generally jangly nature of capoed gui­tar tone. The verse progression makes a slick use of common tones. Here, an F#/A# chord becomes a Bsus2 by simply raising the bass note up one fret while keeping the other notes in place [Fig.3].The F#, C#, and F# (the top part of the chord) are the common tones – tones common to both chords. In the third verse, at least two acoustics are heard. Gtr. 3 arpeggiates the basic F#/A#-Bsus2-F#/A#-G#m7 changes and adds some ornamental pull-off lines, while Gtr. 1 holds down the groove with rhythmically simpler, plucked chords. The distorted electric guitars are brought in at the chorus to give it the proverbial kick in the pants. This terraced dynamics concept (soft versus loud) has been utilized by count­less great bands concerned with dramatic arranging (Led Zeppelin immediately comes to mind), and is always effective. The chorus section is comprised of hard-hitting power chords and barre chords (F#5, B5, and G#m) – powerful, streamlined, and to the point. Acoustic and electric sounds are beautifully combined in the bridge, where the opening acoustic figure is augmented by tasty melodic electric licks played with smooth distortion. 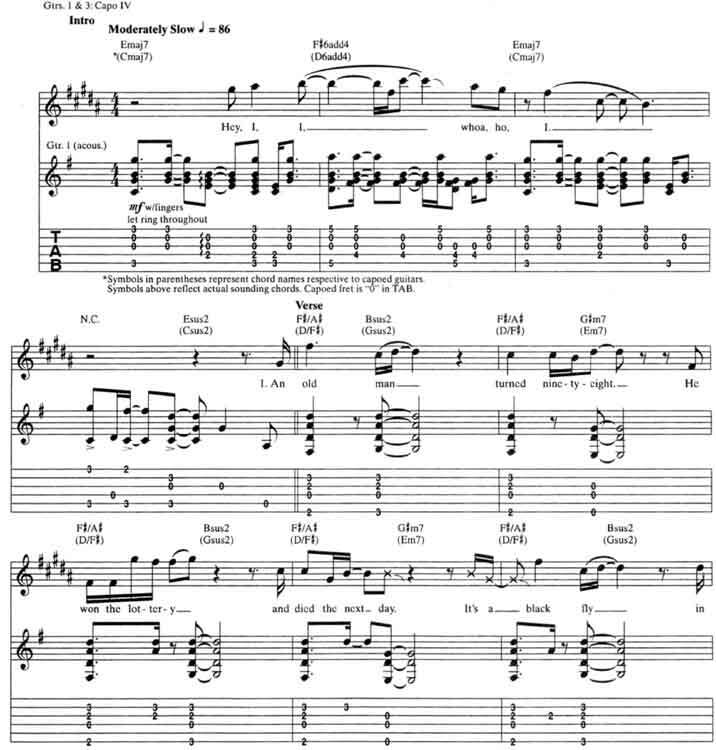 It’s a part of Alanis Morissette Ironic guitar tab and sheet.